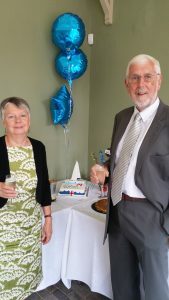 At a champagne reception on 20th June, Rosalind Watchorn Solicitors bid a very fond farewell to Stewart Warden. Stewart joined our firm in 2009 and over the years contributed greatly to the success of our conveyancing team, including securing CQS accreditation from the Law Society – awarded to law firms who achieve the highest standard in residential conveyancing practices. Specialising in residential (home) and commercial property conveyancing, sale and purchase of businesses and business premises and landlord & tenant matters, Stewart qualified in 1974 and has enjoyed a long and distinguished career in Sheffield and the local area. Rosalind Watchorn Solicitors was founded 24 years ago, providing Sheffield and the local area with specialist legal expertise in Conveyancing, Wills and Probate, Elderly Issues and Powers of Attorney. The firm is Lexcel accredited – awarded in recognition of its excellent client care and consistent high-quality service and practice management.